4. Electric Taxi | What Car? 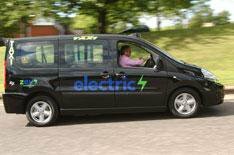 First the good news: the UK's first electric taxi is powered by lithium-ion batteries, has a range of around 100 miles on a single charge and has a top speed of 60mph. It can carry up to six passengers and also provides full wheelchair access. Now the bad news: there's no more noisy diesel engine to drown out the random philosophies of cabbies everywhere. The taxi costs from 39,450 and its maker, Allied Vehicles, expects running costs to be around 500 a month plus VAT, so there'll be no need to tip. Chances of seeing it on the road It's going to happen one day, although not too soon.